I remember the day Robert Kennedy died. My father asked me to come into the kitchen. He pointed to a chair as he sat down across the table from me. I sat obediently and waited. The moment hung heavy. “He didn’t make it,” my father said simply. I have a vague recollection, perhaps incorrect, about going to sleep one night, knowing that Bobby Kennedy had been shot, but that he was still in surgery, and there was still hope. Now, the morning after, all that had changed. A few years before, I remember the teachers at my private school crying and consoling one another the day President Kennedy was killed. They looked at us, children barely old enough to go to the bathroom by ourselves. I could see them worry for our future, but I had no idea what had really happened. I was a kid. It wasn’t a racist comment. The killing of Dr. King was a shock to everyone in our family. My father, though, was always looking forward, over the horizon, around the corner, beyond the event. He feared for the lives of innocent people who he knew would be in danger in the coming, inevitable social unrest. His concerns were soon justified. Riots broke out across the country. The largest mass protest since the Civil War erupted in Washington, DC, with 20,000 people storming to within blocks of the White House. Eleven people were killed in Chicago. Seven died in Baltimore. Hundreds were injured and thousands arrested in cities across the country. And then, just a few months later, came Bobby. Looking back, I thought it could have been the final blow. The last candle of hope, extinguished. 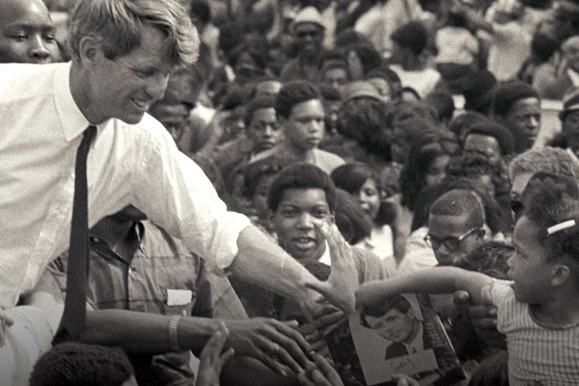 Robert F. Kennedy, a lot of people thought, was the last man who could calm everybody down. It was ironic: the millionaire’s son, the Harvard graduate, was the guy who could walk into impoverished neighborhoods and talk with people credibly, make them believe that tomorrow was going to be a better day. But it wasn’t. He didn’t make it. So we cried. We grieved, but, true to our nature as Americans, we persevered. The same issues that Bobby was so passionate about–poverty, education, civil rights–still face us today. We still endeavor to address them, solve them, resolve them. And embedded in those redoubled efforts, of course, there is hope. Without it, we would not remember him with such recent pain, a never-healing wound of what might have been. With it, we move forward with renewed promise of what still could be. For all his faults, he left us that perfect gift: the will to fight on, even in the darkest moments. Bobby Kennedy’s speech delivered right after he found out Martin Luther King was shot is one of the greatest speeches I have ever heard. His level-headedness, courage, and passion for peace reminds me of why I seek to pursue the Old Money lifestyle.